Enter: Becky's Project 365 kit. This is what started it all. I loved doing this. I loved how taking up this huge commitment helped me to become more familiar with taking pictures. Before this time I never picked up my camera. The only cameras I had at this point was my film point and shoot, which just took too much effort to get the pictures (developing film was a pain), and Jordan's digital camera (a clunky big ole thing that was 4 years old and 10 megapixels behind). It wasn't until Sept 2009 that I got my first DSLR (a Canon T1i), and I have been using it ever since. I love it. I've learned a lot on my camera, so much so that I am starting to think I've outgrown it. When I am good and ready I plan to upgrade to the Canon 60D. But until then I'm sure my current camera will do just fine. This is a spread from June 2008. 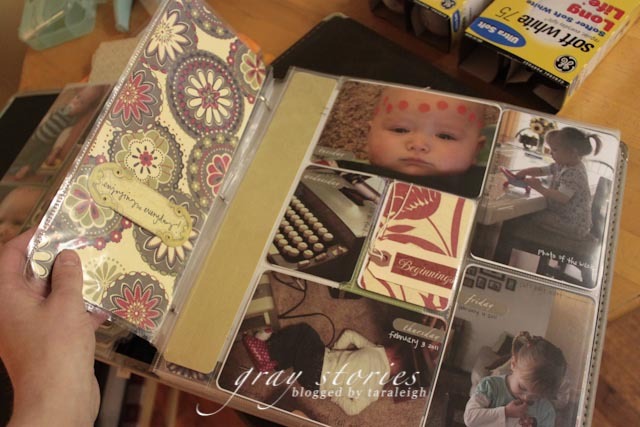 The idea behind this album was taking a photo a day and using the journaling card to document what the photo was about. It was tough but I proudly kept this album up all year. 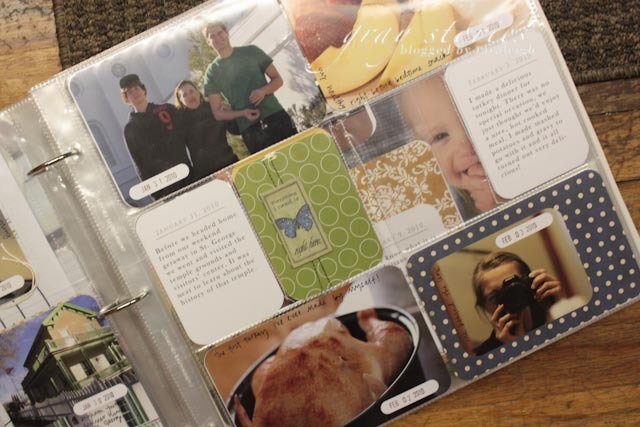 There were times I had to play catch-up as far as the journaling and photo printing, but I maintained the photo-a-day concept. I love that I have captured so much of Liliane's first year (and years following) because of Becky's concept. I'm sure I am not alone in my intense feelings of gratitude for that woman's powerful and innovative ideas. Funny story: I was so worn out (or so I thought) that the idea of doing the photo-a-day thing all over again was daunting. I decided to not do anything for 2010....and in mid-January of that year I had an attack of conscience. How could I not keep up with our family history?? How could I not have a reason to print out the photos I was so in the habit of taking now? The decision to not do anything quickly made a 180. I had to do something. That's when I got busy. I wasn't able to purchase Becky's first Project Life kit, so I improvised. I pulled out a bunch of paper, mostly mis-matched, but in a fun way, and started creating my own so-called kit. It was a good feeling when I let the pressure of taking a picture-a-day go. For 2010 I used photos from when I took them. Sometimes it was every day, sometimes it was 4-5 photos per week. 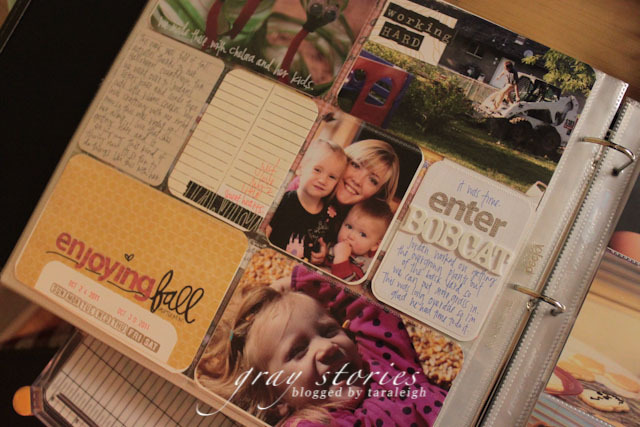 I included bits of our life, coupled with occasional 3x4 journaling and photos. Lots of photos. Sometimes I would write directly on the photo, and when I wanted to say more I would type it on the cards using a template I made in PSE. 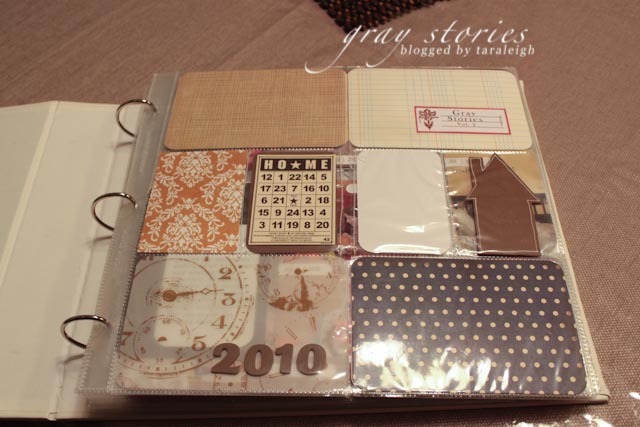 I used a date stamp and the word window punch from Stampin' Up to include the dates when the photo's were taken. 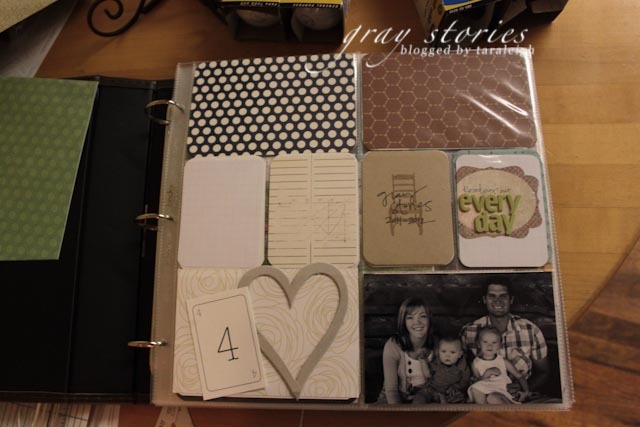 I called this album "Gray Stories" and have labeled every subsequent "Project Life"-like album ever since in the same manner. I have a little secret about this album. It isn't quite finished yet. 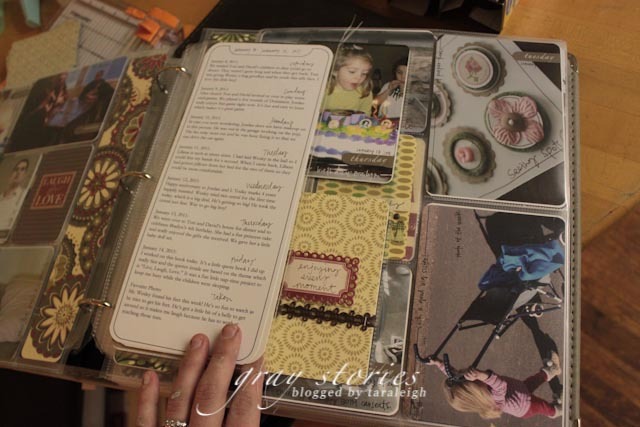 There are about 10 spreads that have photos only and need attention for the other stuff (dates, journaling, etc). But you know what, life goes on! 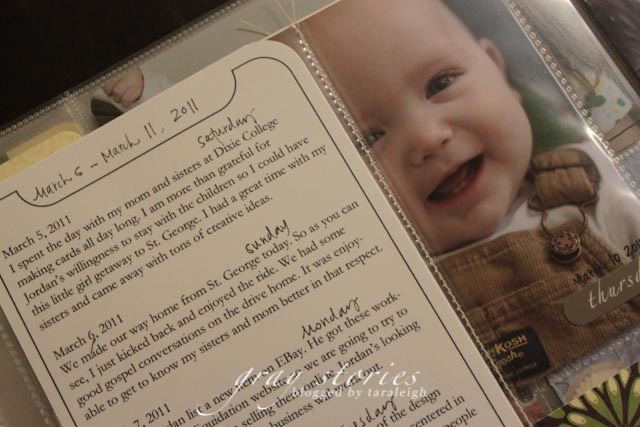 I'm sure I will gather the time to get the rest of the journaling printed and the dates stuck on the photos. But until then, I am not sweating this minor detail. Life happens. That's what life is all about. 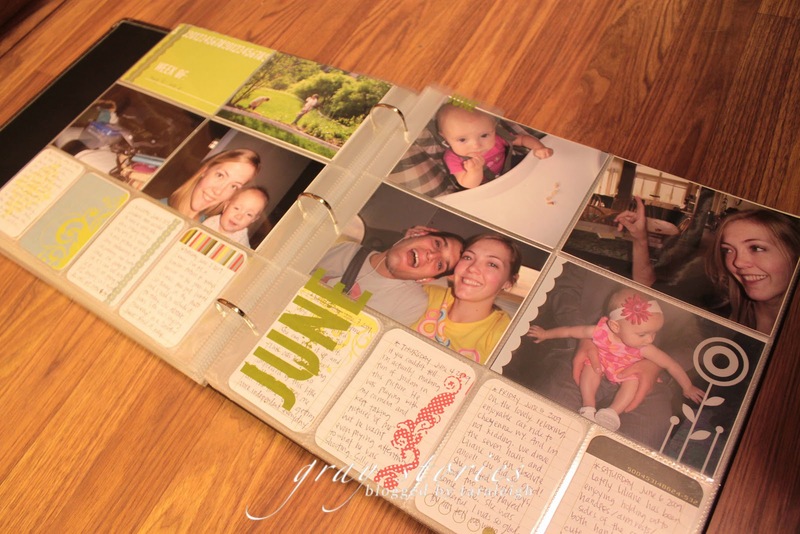 I used 3 different sizes of page protectors for this book: a 4.5x11 (I made these using 8.5x11 page protectors from C-Line), a page protector that holds 4 3.5x5 photos, and this page protector from We R Memory keepers. I also modified these by stitching the middle photo pocket into 2 3x4 pockets. Each spread had the long journaler sandwiched in-between. 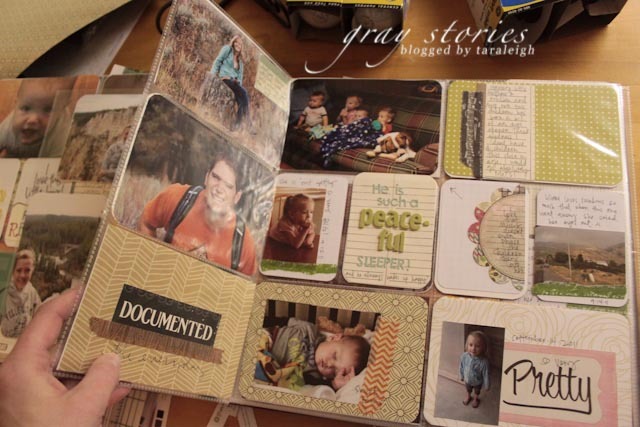 I used the long journalers to document what the photos were all about. On the back I used a patterned paper to fill the space. For this book I brought back the photo-a-day thing. On the days I forgot to take a photo, I fudged it and took one the next day that represented something from the previous day. Even though I liked the overall look to this album, this one invited way too much procrastination. I do better with hand-written journaling only because its fast. You wouldn't think that journaling on the computer would be that hard, but for me I just put it off too much. So, when this book became full at the end of July, 2011, I decided to do a completely different book for the latter part of the year. The entry to this book is still under construction, but that is a good sign. This book is total freedom again. I don't concern myself with taking a photo-a-day. I just use each spread to cover one week, which is a lot easier in my opinion. What I like about this book is that I feel totally comfortable with how crazy it is. 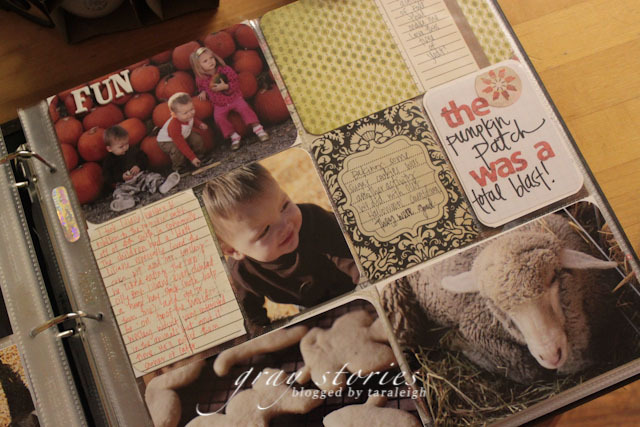 Its fun for me to use my stash (this book has been all about using what I have) and it turns out to be an entertaining book to look at. Some people might think its a bit too eccentric, but I don't care. Our story is being told and that is all that matters. Every so often I end up with more photos for one particular week than others, and when that happens I just add in a few inserts so I can include more photos. Doing this makes it easier because I don't feel that I have to put a lot of pressure on what photos to use. I can use as many or as little as I want. So there you have. A (little too detailed) history of my personal Project Life evolution. I'm seeing so much about Project Life on the internet right now and I have to say it's exciting. 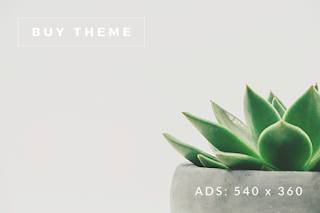 There is tons of inspiration out there, and I, too, have taken advantage of what other people are doing by incorporating little ideas from others into my own album. 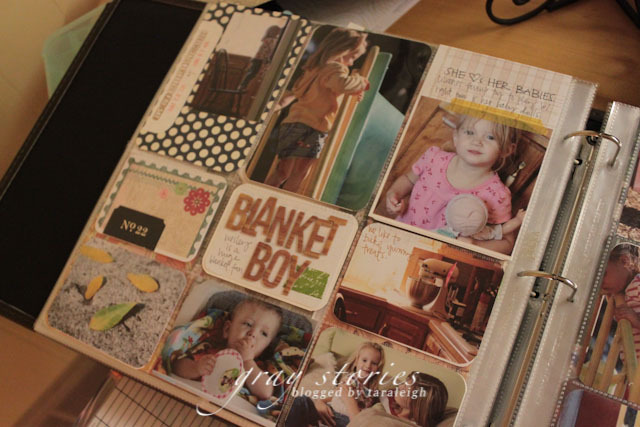 Project Life is a good thing, one that I really can't see myself NOT doing. 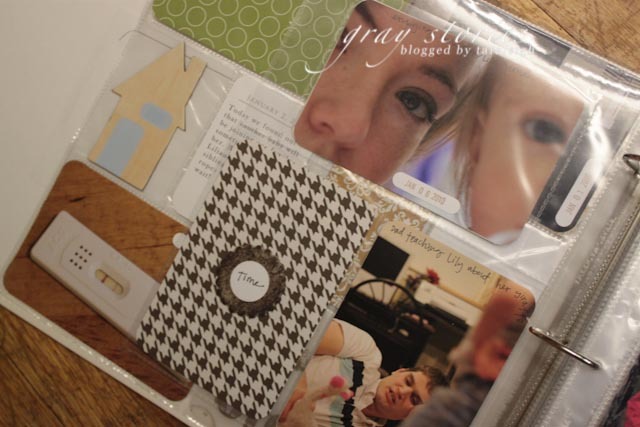 Just a quick note, I totally recognize the overwhelming factor that comes with Project Life hopefuls. There have been several times over the last 4 years that I thought - "I don't think I want to this anymore...." for whatever reason. There was one time I was talking to Jordan about it and he said to me, "Honey, please don't stop. I really like being able to see what is going on in our lives." That was all I needed to hear. Knowing that Jordan appreciates what I am doing to preserve our stories gives me so much motivation. I just keep going, no matter if I get a few weeks behind. My efforts are appreciated, and I'm sure I'm not the only one. So I have never heard of this and I think it is so cool. 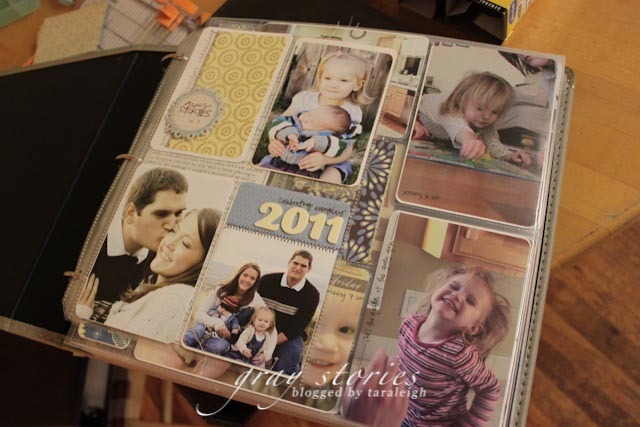 It is such a great idea and I LOVE that you get pictures of ordinary life! You are not only amazing-- you are REAL about what you do and your hopes, desires, and goals and sharing all of this is so wonderful! Thank you for sharing everything and I so wish I could just sit and page through all of it! You are such an inspiration! I love the Project Life concept, and I really want to start doing it. When I saw one of your albums up close and personal, I realized it is something I can totally do! I've been wanting to do this for so long! I love seeing all your amazing projects and I'm so glad you share them, it really is so inspiring. Thank you!